We will pick you up early in the morning from your hotel in Dahab then drive to Sharm El Sheikh Airport to board the flight to Cairo. Meet in Cairo airport then transfer to the Egyptian Museum, home to about 160,000 artifacts covering almost all the pharaonic periods of ancient Egypt including the priceless exhibit of Tutankhamun. 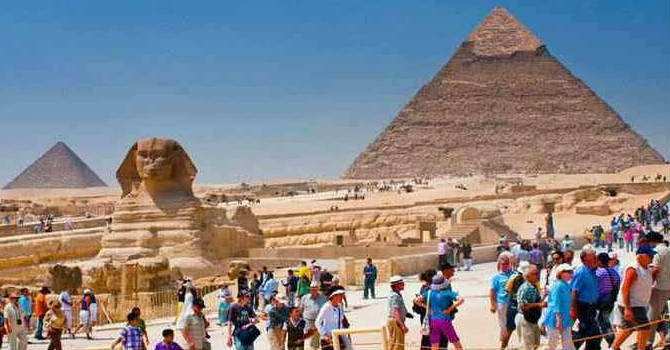 Get your lunch then pay an afternoon visit to the Pyramids and Sphinx in Giza plateau, erected about 4600 years ago first by king Khufu followed by Khafra & Menkaura. Drive to the city side the plateau to visit the mysterious Sphinx with Chephren mask and body of Lion, then explore the Valley Temple attached to the pyramid complex of king Chefren. Proceed to Khan el Khalili bazaar to enjoy free time strolling through the streets and to bargain for souvenir before getting the flight back to Sharm el Sheikh and transfer to your hotel in Dahab.